The Most Reverend James Massa was born in Jersey City, New Jersey, to the late Andrew and Irene Gilbert Massa. 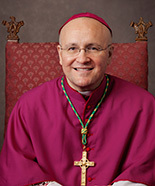 He attended Boston College and graduated with a Bachelor’s in Theology and History in 1982. In 1985, he earned a Master’s of Divinity Degree from Yale University, and in 1997, a Ph.D. in Systematic Theology from Fordham University, where he wrote his dissertation under the late Cardinal Avery Dulles.